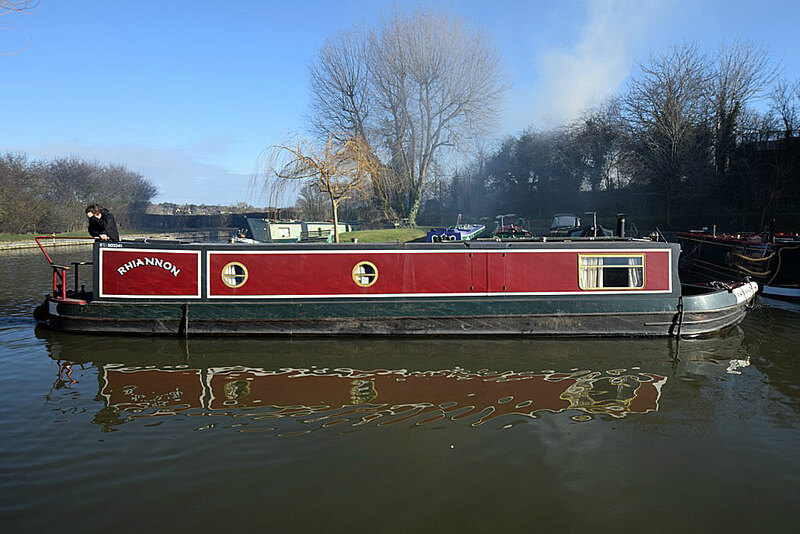 Rhiannon 45ft Traditional narrowboat was built in 1997 by the well regarded G&J Reeves and fitted out by Aynho Wharf. She is a very comfortable go anywhere sized boat for 2 people which has room for guests. A stove has recently been installed to allow the boats use all year round. She has been well looked after, regularly maintained and is in good condition. A good sized open well deck with storage lockers leads into the open plan but cosy saloon which has the stove, a radiator and a sofa bed with a detachable table for dining. Through into the very practically layed out solid oak galley with laminate worktops . This houses the 4 burner gas hob with raised level oven and grill over the fridge, and various useful cupboards and shelves. A side hatch with roof opening is opposite the cooking area. There is also a fully sized Perspex window to fit the hatch and roof. Into the corridor from which you enter the bathroom. A good sized room for a boat of this size, hosting a Thetford cassette loo, a half sized bath with curtained shower over, and neat basin in vanity unit. The bed is a fixed double 6’4” in length with storage beneath, and there is a good size wardrobe at the foot of the bed plus more storage above and in the steps area. The engine room has storage space along with a radiator to hang wet clothes. The boat has an Eberspacher diesel fired heating system. Rhiannon 45ft Traditional narrowboat is a charming boat.